The fruit juice industry is currently in a relatively healthy state, both locally and globally, with many opportunities presenting themselves for manufacturers and producers despite the challenges within the industry. Insight Survey’s latest SA Fruit Juice Industry Landscape Report 2018 discusses the global and local fruit juice markets based on the latest information and research. It examines the market drivers and challenges, as well as global and local market trends to present an objective insight into the environment, market dynamics, and future of the South African fruit juice industry. Globally, the fruit juice market is currently doing well, reaching 60.7 billion litres in retail sales in 2017, with continued growth being predicted until 2022. 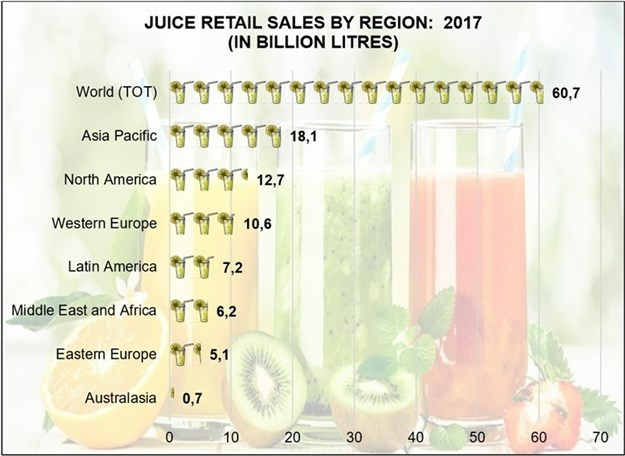 The largest market for fruit juice products in 2017 was the Asia-Pacific region with a total of 18.1 billion litres in retail sales last year. The value of the fruit juice market in South Africa increased strongly between 2012 and 2017, achieving a compound annual growth rate (CAGR) of 12.1% over the period, and is expected to grow at a CAGR of more than 10% over the next five years. 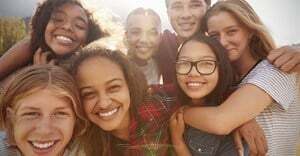 This growth, both current and forecasted, is largely due to the adoption of healthier and alternative lifestyles amongst South African consumers. Higher nutritional and health awareness, together with an increasingly stressful and time-constrained society, has resulted in consumers looking for convenient and cost-effective ways of fulfilling their daily nutritional needs. Linked to the healthy living trend, alternative dietary lifestyles are becoming increasingly popular amongst South African consumers. However, these alternative diets and their accompanying dietary restrictions often leave the adherent’s body depleted of nutrients that would be gained through eating the restricted food. As a result, vegans, and adherents to other restricted diets are increasingly turning to Fruit Juice to obtain their essential vitamins and nutrients, which is driving further growth in the market. While the healthy living trend has been a driver for the fruit juice market, the market has also seen the emergence of other health-oriented beverages, including coconut water which currently represents one of the main competitors to fruit juice. Furthermore, the South African sugar tax is likely to impact the South African fruit juice market significantly and manufacturers will have to adapt to this new legislation by decreasing sugar content and making increasing use of sweeteners in their products. From this, it is clear that consumer lifestyle choices, as well as competition and legislation, will be highly influential in terms of fruit juice consumption in the South African market. Therefore, to effectively compete in a complex industry it is important for key stakeholders to gain perspective and insights into these, as well as other, factors influencing the local fruit juice market. The South African Fruit Juice Industry Landscape Report 2018 (127 pages) provides a dynamic synthesis of industry research, examining the fruit juice market from a uniquely holistic perspective, with detailed insights into the entire value chain – from production through to consumption. What are the key factors that are driving and restraining the growth of the local and global markets? What are the latest global trends, drivers and challenges? What are the latest South African fruit juice industry trends, drivers and challenges? Who are the key players in the SA fruit juice industry? Who are the key retail players in the SA fruit juice industry? What are the prices of popular fruit juice brands across South African retail outlets? or directly on (0)10 140-5756 or (0)21 045-0202.